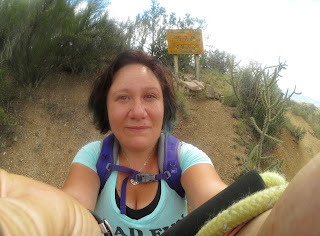 The La Luz Trail, just north of Albuquerque is an 8 mile trail leading up to the Sandia Crest peak. You can find out more about it on SummitPost, but I found the most helpful information to be on Cloudhiking. This is one of the most popular trails in the Cibola National Forest in central New Mexico. It's also one of the most deadly. Supposedly, a total of 5 people died on the trail in 2015 (4 of them hikers). Most hikers only hike one way. They'll either go up, and take the Sandia Tram down, or they'll take the tram up and have someone pick them up at one of the trail heads. Dogs are not allowed on the tram. It's also an exhausting trail. The elevation gain (3,900) happens in short bursts, so you become winded after only a few switchbacks up the trail. This trail is currently my "white whale" -I know I can do it, I know I can reach the summit. I might be completely worn out, but I know it's something I can accomplish... However, I really, really don't like to hike without my dogs, and out here in the "Wild West" I'm nervous to hike alone. So I've been "training up" my dogs to do the whole thing. This is one of our latest excursions done up the mountain trail. Over the next couple months, I'll be blogging and vlogging about this trail. 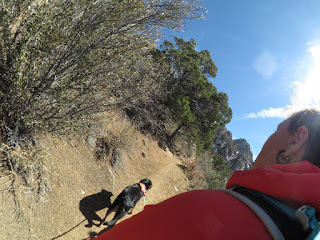 I'll also share with ya'll all the gear me and the dogs use, as well as tips we've found helpful going from casual day hikers, to some-what serious hikers :) ...It's all in good fun, and I consider the dogs and me to be "ordinary hikers" -we're out there to have fun, see cool stuff, maybe even pee on a few things. But we also want to be safe, be prepared, and be knowledgeable of our surroundings. So I hope you continue to check out this blog, and stay tuned for our videos. This is going to be a fun adventure. Before we start with the long-winded introductions, let's try a test post just to make sure this thing is working!